Interviewer: Ok, some basic questions; where do you live? 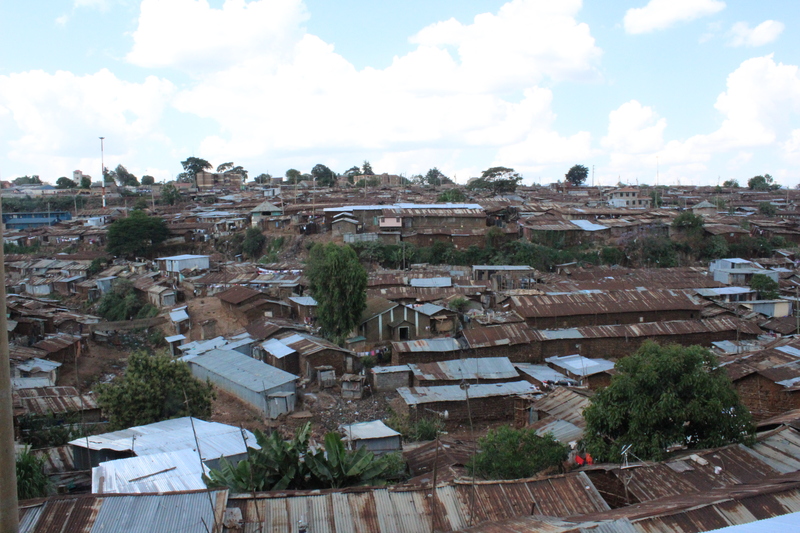 Happiness: I live in Kibera, just outside Nairobi, Kenya, a place known as 42, the centrum of Kibera. I live there with my little brother, it is just us. My mum moved and got married. It was hard in the beginning because it was a new experience for me, to be in charge of the household and my brother, but I am trying to get used to it. Interviewer: If you only could describe yourself in three words, what would they be? Happiness: Wow, just three words… That’s really difficult! Hm, okay… I would say Fun… Caring and can I say Talkative, because I really do like to talk, haha! Interviewer: Yes, it is fine to say talkative. So what would you say that your favorite thing is to do, like hobbies? Happiness: My favorite thing to do in my spare time is dancing. I just love it! I also like to go swimming, watch a movie every once in a while, listen to music and sometimes, not all the time, read a good book. Interviewer: So when did you know you loved dance? Happiness: I found the passion for dance when I was 8 years old and ever since I have been dancing everyday. I found it the best way to express my emotions when words are not enough. I can release so much energy into it and just be myself. I truly feel happy when I am dancing. Interviewer: So you have been at Wale for a while, when did you join and why? Happiness: I am one of the founders of Wale Wale Kenya. It started with that I was in another organization that just focused on dance, but that organisation became no good and not a safe place to be, so Monica, also one of the founders, took with her some youths, myself included, and started Wale Wale Kenya. For me Wale Wale Kenya has developed and become a needed space away from home. I was curious about dancing and as a kid you just want to try a lot of things. Interviewer: Wow, that sounds brave. So what would you say is your favorite thing about Wale? Happiness: My favorite thing about Wale Wale Kenya is that it has become a second home to me. I can just come here and do things that makes me happy, forget problems at home or just problems with life in general. It is such a nice feeling to be with people that makes you smile and that feels like a second family. I love that Wale is a youth based organisation, it is run by us and that gives us empowerment, that our voices are heard and that we can make the choices. I am a very talkative person so to interact with people is something I really like, especially the relationship with the younger youths and the leadership skills that is really building me up. This is nothing that I would learn from school and it is a first hand experience as well as free. Interviewer: So what would you say that your dreams are? Happiness: My dreams is to finish my studies and later on be able to get a job. I want to be independent, to take care of myself and my life. I want to be able to answer the question ’What will happen tomorrow?’ to plan for the future and not just live for the day. Interviewer: Okay, here are some funny questions, just to get to know you a bit more. So if you could have any superhuman power/ability, what would it be and why? Happiness: If I could have any superhuman power/ability it would be invisibility. I would like to appear whenever I want and wherever, feel like I can choose when and where I want to be present. If I don’t like being at some specific place I could just disappear. This would actually get me out of trouble a lot, haha, and I would like to see who misses me when I am gone. Interviewer: And if you only could pick one, which would you pick: being world-class attractive, a genius or famous for doing something great? Happiness: Haha, if I would pick one of the three options of being world-class attractive, a genius or famous for doing something great, I would do something great. Like start a lot of organizations that will focus on helping kids in their everyday lives — everything from helping them when they are growing up, to figure out life and just to be a helping hand. I would be such an amazing feeling to help others and to hear that; ’If it wasn’t for her I would not have made it’ or ’I am so grateful that she started this organization and that it gave me a second chance in life’. Interviewer: Changing subject, lets talk about food. If you could eat only three foods for the rest of your life, what would they be? Happiness: Haha, if I only could choose three foods for the rest of my life it would be fried bananas, the ones that are made in Tanzania, not the kenyan one. Biriani rice, because it is cooked in a very complicated way and my mum cooks it really well and the third one would be chicken hot wings, haha, because they are just so delicious! It would be all in one, a full meal! Interviewer: If you could travel anywhere in the world, where would you go and why? Happiness: If I could travel anywhere in the world I would travel to Los Angeles (LA) in the US, because of my favorite music band is form there — ’Mindless Behaviors’, a boy band which is so cute, haha. The city is so alive and vibrant and I have noticed that the more you travel the more you want to see new places. Interviewer When talking about leadership, if someone asked to be your apprentice and learn all that you know, what would you teach them? Happiness: If I had an apprentice that would learn from me I would teach them that it is okay to not be okay. That everything always turns out great but that nothing comes easy and that hard work really pays off! I would also teach them everything I know about dance, making jewelry, to not be shy — be outgoing! And make sure that they are fit, haha!